Welchol, along with diet and exercise, is the only FDA-approved medicine with a single active ingredient proven to lower both high blood sugar (A1C) and LDL-C or “bad” cholesterol in adults with type 2 diabetes and high cholesterol. WELCHOL is not for everyone. Please see Important Safety Information below. Phenylketonurics: Welchol for Oral Suspension contains 27 mg phenylalanine per 3.75 gram dose. *Based on a $0 co-pay for a 90-day supply. †Based on a $10 co-pay for a 30-day supply. §Restrictions apply based on eligibility. Looking for support and educational resources? See what the Welchol ADDvantage Program™ has to offer! There is no fee from Daiichi Sankyo, Inc. to receive messages. Message & data rates may apply–this can be checked with your mobile service provider. Charges are billed and payable to your mobile service provider or deducted from your prepaid account. Consent is not a requirement for purchase. Data obtained from you in connection with this SMS service may include your cell phone number, your carrier's name and the date, time and content of your messages. We may use this information to contact you and to provide the services you request from us. Alerts sent via SMS may not be delivered if the mobile phone is not in range of a transmission site, or if sufficient network capacity is not available at a particular time. Even within a coverage area, factors beyond the control of the wireless carrier may interfere with message delivery, including the customer's equipment, terrain, proximity to buildings, foliage, and weather. The wireless carrier does not guarantee that alerts will be delivered and will not be held liable for delayed or undelivered messages. We will not be liable for any delays in the receipt of any SMS messages as delivery is subject to effective transmission from your network operator. The service is available on these US carriers only: Verizon Wireless, Sprint, Nextel , Boost, T-Mobile®, AT&T, Alltel, ACS Wireless, Bluegrass Cellular, Carolina West Wireless, CellCom, Cellular One of East Central Illinois (ECIT), Cincinnati Bell, Cricket, C-Spire Wireless, Duet IP (AKA Max/Benton/Albandy), Element Mobile, Epic Touch, GCI Communications, Golden State, Hawkeye (Chat Mobility), Hawkeye (NW Missouri Cellular), Illinois Valley Cellular (IVC), Inland Cellular, iWireless, Keystone Wireless (Immix/PC Management), MetroPCS, MobiPCS, Mosaic, MTPCS/Cellular One (Cellone Nation), Nex-Tech Wireless, nTelos, Panhandle Telecommunications, Pioneer, Plateau, Revol Wireless, Rina-Custer, Rina-All West, Rina- Cambridge Telecom Coop, Rina-Eagle Valley Comm, Rina-Farmers Mutual Telephone Co, Rina-Nucla Nutria Telephone Co, Rina- Silver Star, Rina- South Central Comm, Rina- Syringa, Rina- UBET, Rina- Manti, Simmetry, South Canaan/CellularOne of NEPA, Thumb Cellular, Union Wireless, United Wireless, U.S. Cellular, Viaero Wireless, Virgin Mobile, West Central Wireless (includes Five Star Wireless). As a member of the Welchol Mobile Communications Program, you will receive automated messages to the mobile number provided. You can unsubscribe from this service at any time by texting STOP to 89694. By subscribing to the Welchol Mobile Communications Program, the user consents to receive, from time to time, further text messages from Welchol, other parties within Welchol, and its partners. Message & data rates may apply. If you have any questions, contact us at 877-437-7763. What is Welchol® (colesevelam HCI)? Welchol, along with diet and exercise, lowers LDL or “bad” cholesterol. It can be taken alone or with other cholesterol-lowering medications known as statins. Welchol lowers LDL cholesterol in boys, and in girls who have had a menstrual period, ages 10 to 17 years, with a condition known as heterozygous familial hypercholesterolemia (a genetic disorder that causes high cholesterol) alone or with other cholesterol-lowering medications known as statins after inadequate control with diet alone. Welchol, along with diet and exercise, also lowers blood sugar levels in adult patients with type 2 diabetes mellitus when added to other anti-diabetes medications (metformin, sulfonylureas, or insulin). Welchol should not be used to treat type 1 diabetes or diabetic ketoacidosis. Welchol has not been studied with all anti-diabetes medications. Welchol has not been studied in children younger than 10 years old or in girls who have not had a menstrual period. Welchol is available by prescription only. Ask your HCP if Welchol is right for you. a history of pancreatitis (inflammation of the pancreas) due to high triglyceride levels. Welchol has not been shown to prevent heart disease or heart attacks. Tell your health care provider (HCP) if you have high triglycerides (greater than 300 mg/dL). Tell your HCP if you have stomach or intestinal problems, including gastroparesis (when the stomach takes too long to empty its contents), abnormal contractions of the digestive system, a history of major gastrointestinal tract surgery, if you have trouble swallowing, or if you have vitamin A, D, E, or K deficiencies. Welchol has known interactions with cyclosporine, glimepiride, glipizide, glyburide, levothyroxine, certain birth control pills, olmesartan medoxomil, and metformin extended release (ER). Welchol has not been studied with all combinations of drugs and supplements. Please tell your HCP about all medications and supplements you may be taking before beginning Welchol, as your HCP may tell you to take your other medications and supplements 4 hours before taking Welchol. Remember to tell your HCP if you are pregnant, plan to become pregnant, or are breastfeeding. Welchol (colesevelam HCl) for Oral Suspension should not be taken in its dry form. Welchol for Oral Suspension is recommended for, but not limited to, use in appropriate pediatric patients as well as any patient who has difficulty swallowing. For patients having difficulty affording their Daiichi Sankyo medication, please call the Daiichi Sankyo Patient Assistance Program at 1-866-268-7327 for more information or visit www.dsi.com/news/patientassistance.html. Click here for full Product Information about Welchol. To the Patient: You must present this card to pharmacist along with your WELCHOL® (colesevelam HCl) prescription to participate in the program. 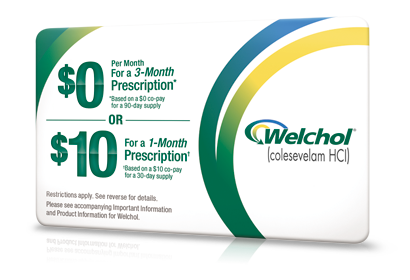 For patients with commercial insurance, savings per prescription of WELCHOL will apply after the following out-of-pocket expenses are met: $10 per prescription for a 30-day supply of WELCHOL or $0 per prescription for a 90-day supply of WELCHOL. Offer may not be combined with any other program offer or discount for WELCHOL. 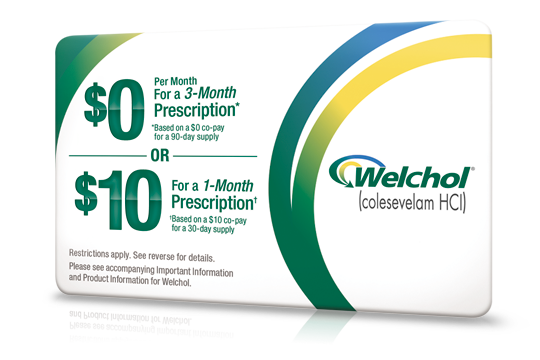 Savings for WELCHOL are subject to a maximum benefit of $150 per 30-day prescription or $450 per 90-day prescription. If you have questions regarding your eligibility or benefits, or wish to discontinue participation, call (866) 566-4606 (8 AM – 8 PM ET, M-F). When you use this card, you are certifying that you understand the program rules, regulations, and terms and conditions. You are not eligible if you are enrolled in any state or federal health care program, including, but not limited to, Medicare Part D or Medicaid, VA, DOD, or TRICARE/CHAMPUS; or where taxed, restricted, or prohibited by law; or if you do not otherwise comply with the terms of this card. Further, you agree to discontinue using the card if you enroll in any state or federal health care program during the program period. Offer valid in US and Puerto Rico only. To the Pharmacist: When you use this card, you are certifying that the patient is not enrolled in any federal, state, or other governmental programs for this prescription. Submit transaction to McKesson Corporation, using BIN #610524. If primary coverage exists, input card information as secondary coverage and transmit using the COB segment of NCPDP transaction. Applicable discounts will be displayed in the transaction response. Acceptance of this card and your submission of claims for the WELCHOL ADDvantage Program™ are subject to LoyaltyScript® program Terms and Conditions posted at www.mckesson.com/mprs. Patient not eligible if enrolled in any state or federal health care program, including, but not limited to, Medicare Part D or Medicaid, VA, DOD, or TRICARE/CHAMPUS, or where taxed, restricted or prohibited by law. Offer valid in US and Puerto Rico only. LoyaltyScript® is not an insurance card. For questions regarding setup, claim transmissions, patient eligibility, or other issues, call LoyaltyScript® for the WELCHOL Savings Plan at (866) 566-4606 (8 AM – 8 PM ET, M-F). WELCHOL is a registered trademark of Daiichi Sankyo, Inc.